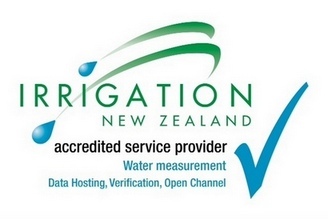 A range of tools are available to assist irrigation management. Some of these are there simply to help monitor compliance with consent requirements, while more complex systems give you a wealth of infomation on soil conditions, power and water use. A low cost stand alone sensor with a dial readout of soil water potential. A simple soil water potential device that provides clear visual information on how hard it is for plants to extract water from the soil. The yellow dots indicating moisture stress can be seen from up to 15m away so you can clearly see when you need to irrigate. A highly accurate portable TDR sensor that measures soil moisture content (volumetric %). A stand-alone datalogger compatible with both older mechanical, and newer solid state flow loggers. Designed specifically for and approved for consent compliance by Regional Councils in New Zealand. Large LCD display provides immediate information on water take to the user. A telemetered version of the standard Xisys Flow Logger above that delivers data automatically to a password protected web site, accessible by both the irrigator and the Regional Council. A rugged station to monitor soil moisture and your flow meter to assist irrigation management and consent compliance. Options can include soil conductivity, soil temperature and/or rainfall measurement and alarms. All Cambell Scientific stations desribed can be combined into a network with data retrieval to a single point. This allows you to combine a weather station, remote soil and flow monitoring stations for comprehesive data about your farm conditions. Wireless communication between stations with powerful spread spectrum radios allow you to get all the data from just a single point.